Refrigerators in the Moroccan desert; a bracelet to prevent heart attacks in Tunisia; a source funding system for charities in Egypt. Mission-driven start-ups are blossoming in these three North African countries, which are now at the forefront of social entrepreneurship. Morocco now boasts more than 250 start-ups. With around 100 seed-stage startups, Tunisia is ranked seventh in the world as the best place to launch start-ups by SeedStars World. Egypt broke records with the creation of thousands of start-ups in 2012 and 2013, according to the Egyptian bureau of statistics. How can we explain the meteoric rise of social-oriented start-ups in countries where economic indicators remain weak? According to the data company Mattermark, while for several years North African start-ups mainly flourished in sectors like e-marketing and online dating, since 2012, they have begun appearing in areas such as banking, health, lending, currencies and e-commerce. This trend towards collaborative economics makes sense in emerging markets where the start-up business is a little under ten years old. Since these countries began to attract the interest of foreign investors, several generic accelerator programmes have popped up, such as Flat6labs in Tunisia, and Innov Invest and Numa in Morocco. Foreign backing helps finance such businesses, which are seen as unstable and insecure, and consequently receive little or no funding from traditional local banks which bridle at the prospect of a slow return on investment. It should be noted that these countries have retained a European-style investment model mainly based around banking institutions. For young entrepreneurs, foreign backing may be the only available funding source. Besides the “investment gap” left by the banking sector in countries that refuse to finance start-ups, foreign investors have also noticed the significant opportunities for positive social impact. According to the Tunisian National Institute of Statistics (NIS) and the Moroccan National Institute of Statistics and Applied Economics, these companies are made up of people whose mean age ranges from 25 to 32. Young people, especially qualified young people, are terrified by rampant unemployment rates in the region. 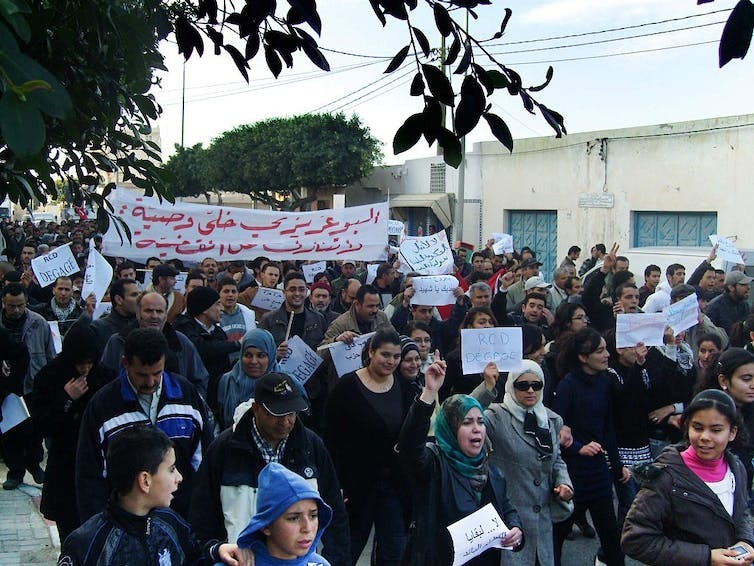 According to the NIS, there were 267,700 out-of-work graduates in Tunisia in the third quarter of 2016, amounting to 31.9% of the total number of unemployed people. These young unemployed people are for the most part talented, ambitious, unfazed by change and interested in new technologies – skills sets that represent real value for investors speculating on the new economy. Political and social movements in Egypt and Tunisia had a strong influence on the people behind innovative projects. While the Egyptian and Tunisian revolutions were not necessarily responsible for the rise of these start-ups, they helped drive their proliferation. The new generation has realized that it can play by a new set of rules. The Arab Spring freed up young people and taught them that change is not impossible and they are capable of controlling their own destinies. My research on start-ups and young entrepreneurs has revealed one striking common attribute: whether Tunisian, Moroccan or Egyptian, they are overwhelmingly socially oriented. Knowing their countries’ economic difficulties, they are driven to fight unemployment, not just by launching their own businesses, but also by improving the lives of their fellow citizens. A great number of these start-uppers are creating transport and health projects with the aim of compensating for insufficient government investment. For example, Tunisian start-up BeThree, the brainchild of three students from the Esprit engineering school, has succeeded in developing a smart bracelet that detects abrupt changes in cardiac rhythm and arterial blood pressure in order to prevent heart attacks. A few months ago, this start-up was in talks with Wonka Lab, a Los Angeles-based start-up accelerator. “Wonka Lab offered to help us develop our product for the American market,” one of the entrepreneurs told French newspaper Le Monde. Casablanca start-up Carmine facilitates car sharing, a solution for young professionals who cannot afford to buy their own vehicle. As it is still in operation, with an increasing number of available stations, the business is thinking about expanding its mission to include other Moroccan cities. 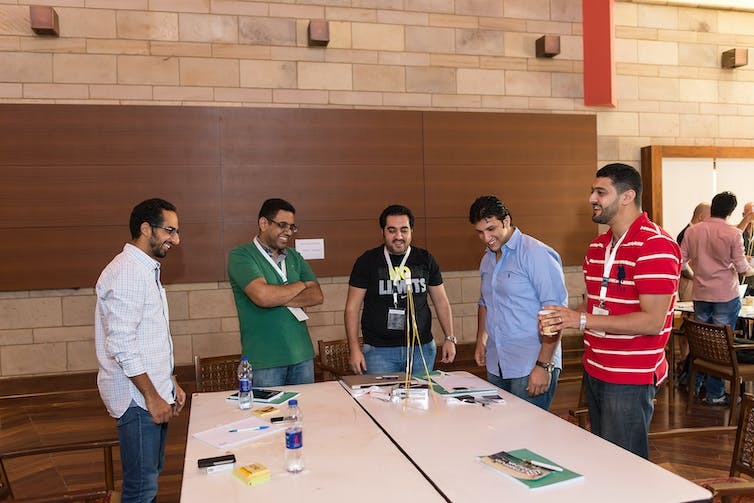 Start-Up MENA gathers together innovative project creators in the region. There are also start-ups in the crowd-sourcing sector, such as Egyptian company Bassita (“simple” in Arabic), which found an innovative way to raise money to provide access to clean drinking water for more than a thousand households. In 2014, this same model was used to raise the funds needed to buy a thousand pairs of glasses for embroiderers in one of the poorest regions; in 2015, it allowed thirty children who had never seen the ocean to spend a day by the Red Sea. Moroccan start-up Safa, also created by students, at the Mohammadia engineering school, developed a clay-and-wood water filter. They decided to employ housewives to build the filters and gave them a share in the profits. Regardless of country or industry, today’s start-ups are vulnerable because of their heavy dependence on private investment during the seed phase, which can discourage backers. Start-ups will have a significant role to play in the economic future of these countries. They now have to attract the attention of policy makers in order to obtain better regulatory and fiscal conditions for their development. Next articleAl-Shabaab: Should the Somali president open talks with the terror group?